By Laura L. Rode (CelebrityAccess) – Known for their electrifying performances and fronted by band founder Brad Arnold -lead vocalist, Chris Henderson -lead guitar and the members of 3 Doors Down; embarked on an uniquely staged acoustic tour over the Summer of 2014. 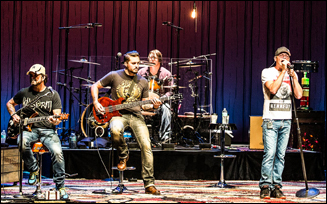 Coast to coast, fans have embraced and celebrated the band's acoustic tour since they first began these performances in January 2014, featuring deep cuts and hits from their catalog of songs. As 3 Doors Down embark on the final few shows of this unique “Songs From The Basement” acoustic tour, lead guitar player Chris Henderson took a break from the tour and opening season of NFL games to provide some insight into the future for one of America’s most beloved bands. Sitting in a small room somewhere within the historic Florida Theatre located in the heart of historic downtown Jacksonville, FL Chris discussed the bands experience in Japan and a glimpse of the future of 3DD. LR: Let’s start by how the game went today? CH: Well I’m a diehard Saints fan, they lost, so not good (frown/shrug) – it happens. LR: How’s the last leg of this Acoustic tour going? CH: Well, it seems to be going real well. It’s been hit or miss, but the majority of shows have been sold out so far. LR: What’s been your favorite stop on this tour? CH: I’ve been to so many places they seem to just run together now, I have to stop and think. I don’t really have a favorite. LR: Have there been any interesting stories you can share with us since the unique setting for these shows are typically in smaller venues lends itself to more interaction from the fans? CH: The crowd will always holler things out, one of the most common shout outs is “Play SKYNYRD!” which this is Jacksonville and I totally expect a lot of that tonight, can you since my enthusiasm (sarcasm) …hahaha. LR: Will you be incorporating some of the acoustic sets now into your other “plugged in” live shows? CH: I really don’t know yet, I think we’ll be done with it for a while. And we’re starting on our new record, so we’ll be focusing on that after these last shows are complete. LR: So how is the new record progressing? CH: We’ve completed 3 songs for it so far. Its hard to create a record on the road as writing songs on the road typically tend to be about “life on the road” or missing someone special back home….”Here with out you’s”, “When I’m gone’s”, we’re just trying not to do that this time. LR: However those are some of your most successful? CH: Yeah but if you already know going into it what the songs are going to end up being about, it just kinda takes the fun out of it. LR: How involve are you in the writing process? CH: Oh yes very and always have been. LR: With the last record you actually pulled in some outside writers, will that being happening again with this record? CH: We co-wrote with some people which was really a disaster, co-writing just really doesn’t work that well for us, co-writers tend to rewrite your music – then fans say hey you just kinda rewrote that same song. Co-writers, They study your music rearrange it and kinda regurgitate it right back to you, it really is a disaster. LR: From what I’ve noticed, your most successful hits seem to have been written solely by the band? CH: Yes, absolutely and no not anymore will we be bringing in outside writers. It really doesn’t help at all, I mean if you’re a pop singer or one of those country guys who really don’t write their own music, then by all means if that works for you. But for rock guys, we just don’t. LR: Do you think the record will e ready by the end of the year? LR: Tell me about the experience in Japan. CH: It was really cool. We love playing for the troops, we love to give back to them. Not because it’s the cool thing to do, but because it’s the right thing to do. I know first hand when I was in the Navy for a really long time, I know first hand they are not doing it for the money. People do it because they love their country. They get sent over sea for months at a time and don’t get to see their families, we do it for months at a time and that’s one thing, I get to go home every few weeks, but these guys can be stuck over there for 6 or 7 months in the dessert with limited communications – they black those guys out where they can’t have contact like we do with no internet, no Instagram no Twitter… things we take for granted they get taken away from them. You’ve gotta respect that, they’ve got to do a really crazy job as it is. We take a a lot of pride in the fact that they ask us to do that and so we really want to do that . performed at the Marine Corps Base Hawaii on July 5, 2008 in Honolulu. The Okinawa visit marks their first show in Japan. LR: Will the band be going back over? CH: Sure, if they ask us to, we respect and do what they ask us to do. LR: After the new record drops will we see a new tour? CH: Oh I’m sure, probably. LR: Where do you see the band in 10 years? CH: I know we’ll still be working and that we’re not going anywhere plus with the state of music these days, its not like we’re can go apply for another gig somewhere, like I’m gonna go to medical school or something, it’s just not gonna happen, especially now I have tattoos all over my hands and arms…LOL can’t work at your bank anymore you know what I mean. I think we’re pretty much stuck in this lifestyle, so we will be around for a while continuing to write and make new music, carving our own little place in the world for ourselves. LR: One last question before you run back to those football games…. What’s your “go to” guitar? CH: Paul Reed Smith, electric. But for the acoustic tour I’m not using that actually I’m using a big acoustic traditional guitar, I’m using a semi-hollow body piezo which is an acoustic-electric, which works out pretty good they sound just as good as any acoustic guitar out there and they’re just as easy to play. LR; Well I look forward to seeing you guys’ play tonight. Thank you very much for your time and on game day, I know it’s a tough day to interview (grin).